Rod Gragg discusses his broadcast career with several media outlets. He talks about his experiences at Coastal, first as a student and much later his return to campus to establish its first department for public relations. He reviews the major Coastal news stories of that time (1980s - early 2000s), including the residence halls and independence from USC as well as the growth of the region. Gragg, Rodney O. and Tomczyk, Charmaine B., "Rodney O. Gragg, oral history interview" (2016). 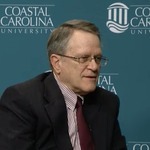 The Coastal Carolina University Oral History Project. 11.